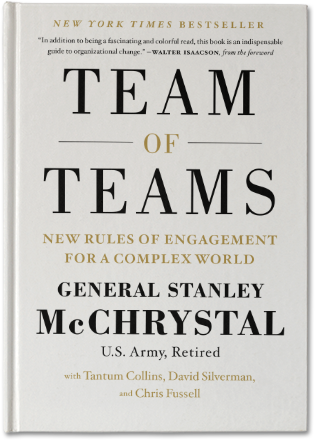 I'm willing to bet that every PEO (program executive officer) in the Pentagon has read General McChrystal's book*, titled "Team of Teams". This book is this year's book on teamwork for the big dogs: PEO's, portfolio managers, and large scale program managers. Obviously, it's written in a pseudo-military context, covering mostly McChrystal's time in Iraq as the senior special forces commander, but the lessons are easily ported to the civilian domain of large scale projects and business or agency endeavors. Networks replace hierarchies; senior management and middle management are all nodes on a common network. As in all networks, multi-lateralism replaces stove-piped escalation. For McChrystal, and especially in a context of time-sensitive opportunities, the first point (dare I say 'first bullet'?) is the main point: it's really speed of decision-making and deployment, made possible by breadth of collaboration. One thing he says that struck me is that no matter how extensive a network, at some point it comes up against the boundary of another network or a stovepipe which is not transparent. Then what? His solution is to send someone into the other camp to be a emissary and collaborator. In the world of States, we call these people ambassadors. The concept is applicable to stovepipes and other management challenges. Reduction style plans are fragile: subject to breakdown in supply and timetables, and require expensive re-work when things go awry (who's not heard: plans are the first casualty of reality?). But.... such plans can be the best way to do something if only all the risk factors would go away. Complexity is non-linear and may be all but unbounded: Nobody has ever calculated how many game of chess there are. "By the third move, the number of possibilities has risen to 121 million. Within 20 moves, it is more than likely you are playing a game that has never been played before"
Big data won't save us: Ooops! did McC not get the memo? Big D is the answer to everything. Well, except for the complexity thing. Just ask the climate people to predict the weather. But, the antidote, by McC's reckoning, is to time-box or pin things to a horizon. Just handle the data and complexity " ... over a given time frame." "Prediction is not the only way to confront threats; developing resilience, learning how to reconfigure to confront the unknown, is a much more effective way to respond to a complex environment."